There you have Pindar’s style. Ode 4.2. 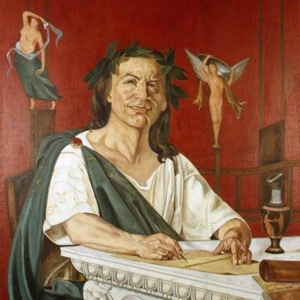 Most likely Horace finished his fourth book of poems around 13 B.C. to celebrate the return of Augustus from the west the previous year. There is contention among scholars, however, about whether the second poem was written before or after 15 B.C., since it omits Tiberius’ victory in Transalpine Gaul and Drusus’ victory in Raetia1. While it could be argued that the poem predates these victories, or that the need to to mention them is satisfied later in odes 4 and 14, both answers indirectly suggest that the aim of the poem is to outline a military victory, which is an assumption. As we progress through the poem we find it increasingly difficult to reduce the poem to a song of military victory. The images, the texture, the unity of the poem point to a more formal and transcendental theme. On the surface it seems that the theme of the poem, which is the praising of Augustus in an almost Pindaric strain, comes to fruition not through a conquering of Gaul, but through a returning to Rome. The difference may at first seem petty, especially considering the militaristic identity of the Romans—the greatness of Augustus is often identified with the greatness of his legions—but the poem, as we shall see, highlights Augustus as the best of all mankind2, not as Imperator. Acknowledging that the focus of the poem is the excellence of Augustus, we must account for his lack in the poem. Augustus is not likened or compared to any great figure. We do not hear of his great virtues, or excellences, or victories. Instead, we are told simply that he triumphed over his enemies,3 that there is none greater nor better on the earth4, and that we owe him praise5. This lack can be explained in two interconnected ways. First through an appeal to the Pindaric style, and second through a reformulation of the theme of the poem. This poem exhibits two features common to Pindar’s odes. First, Pindar would spend more time praising the virtue or feats of some mythical character, and less time praising the athlete who had commissioned the poem. Second, Pindar would often praise his own poetic powers. If Horace does imitate Pindar, it seems likely that like Pindar, Horace would extol Augustus returning victoriously to Rome through the more general theme of desiring and achieving excellence and fame. Since I take the stance that this poem is about the desire to achieve excellence I must identify and explain the imagery used in the poem, and relate this imagery to a unified action. In presenting my reading of the poem I will begin by listing the general motifs, then I will identify specific images or examples of each motif, and finally I will relate those images as motifs to a unified vision of the poem. The three primary motifs which I wish to discuss are 1) the relation between the known and the unknown, 2) the contrast between high places and the low places7, and 3) the use of the natural and the supernatural (i.e images of generation, nourishment, and immortality). Horace begins the poem begins with “Pindarum quisquis studet aemulari. (whoever desires to rival Pindar)”8 The emphasis on Pindar is immediately evident for three reasons. First, we notice his primacy of position, both in the sentence and in poem as a whole. Second, we notice the object-subject-verb rather than the more common subject-object-verb word order. And Third, introducing the rest of the stanza, “Iulle9, ceratis ope Daedalea/nititur pennis vitreo daturus/nomina ponto, (Julle, with the wax-plastered aid of Daedalus/and to have glassy feathers pressed upon him—he will give his name to some sea),” we notice that the desire to rival Pindar, Pindarum quisquis studet aemulari, guides one naturally to an introduction to all three of our motifs. We are introduced to the motif of the known and the unknown by the relating of some unknown poet, quisquis, first to Pindar, perhaps the greatest Greek of poets, but secondly to both Daedalus and Icarus10. Next we have the contrast between the high places through Daedalus, and the low places, such as the sea, through Icarus. We will see later that the poem uses images such as high or vast for images of divine favor and inspiration, and images of the sea, and lower places as images of those lacking favor. Finally, we notice the images of natural generation introduced first through the specific use of ceratis11, and developed later through images of nourishment. We see images of the immortal, or supra-natural through the desire for eminence, which either becomes notoriety in the case of Icarus who is known for failure or it becomes preeminent in the case of Pindar and Daedalus. by measures free from rule. Now, in this second stanza we apply the motifs which introduce the poem to a simile. Poetry falls from the mouth of Pindar, the one who is inspired, the one who is known by us, and his poetry flows down from above to us below, and nourishes us to overflowing. Like torrent rains which nourish and overflow a mountain river. And we notice the manner of this nourishment, put, as it were, in the obscure words of a Dr. Chalmer’s “there was no pausing to enquire, why or how—fervet—ruit—fertur, he boils—he rushes—he is borne along; and so are all who hear him.”18 And notice how the images are extended further in the third stanza. His poem is the conferring of a crown by Apollo, the god of poetry, and he is given the right through his genius to break free from the bounded rules of Greek verse, and to create new and unheard Dithyrambs. Organizing the images into our motifs, we see that mons decurrens, super notas ripas, and fervet ruitque, and profundo are images of spacial difference, or height. A mountain (mons) is the high place from which rolls down the truth of Pindar’s profound voice. The banks rise above their allotted marks (super notas ripas), and then surges downward downward thundering. Pindar is profound (profundo) in the sense that his depths cannot be probed19. The single image of Apollo is enough to further our motif of the known and the unknown. Apollo is the worshiped god of poetry. He is that one to whom all poets sacrifice and aspire. Pindar is given not just some poet’s crown, but the renowned laurel of Apollo. We notice the use of the gerundive, donandus, to emphasis the actual conferring of the wreath. Notice how it is this honor of being called out by Apollo which grants him to carry along unfettered by the rules of his trade20. As for images of generation and the supernatural: the whole simile of the second stanza is guided by an image of nourishment. We see heavy rains (imbres) nourishing (alo) the river, which is likened to the profound uttering (profundo ore) of Pindar. Pindar is nourished from the high places; he is inspired by the Apollo and the Muses. This introduction to the reading of this poem serves a methodological beginning to examining the poetry of Horace, not as historical pieces, but as poetic works of art. One could continue in the same structural vein through each stanza with similar results. This poem, whose topic at first seems to be on the greatness of Augustus’ victories, turns out, instead, to be about the desire to achieve and maintain divine excellence. As we traverse the poem further we find that Augustus, like Horace, has achieved excellence and favor from above, that this excellence has given them a certain identity and name, a place in the Roman mythos, which also nourishes and supports those below who cannot achieve such heights. Do you enjoy Netcrit Articles? Use the affiliate link below to buy a book from Amazon. You’ll receive the gift of knowledge, and we will get a portion of the proceeds. Sign up to receive occasional emails featuring articles or books of interest by our authors.